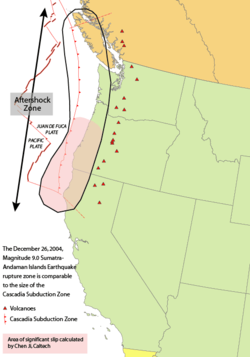 The 1700 Cascadia earthquake occurred along the Cascadia subduction zone on January 26 with an estimated moment magnitude of 8.7–9.2. The megathrust earthquake involved the Juan de Fuca Plate from mid-Vancouver Island, south along the Pacific Northwest coast as far as northern California. The length of the fault rupture was about 1,000 kilometers (620 miles), with an average slip of 20 meters (66 ft). The earthquake caused a tsunami which struck the coast of Japan and may also be linked to the Bonneville Slide and the Tseax Cone eruption in British Columbia. The earthquake took place at about 21:00 Pacific Time on January 26, 1700 (NS). Although there are no written records for the region from the time, the timing of the earthquake has been inferred from Japanese records of a tsunami that does not correlate with any other Pacific Rim quake. The Japanese records exist primarily in the modern-day Iwate Prefecture, in communities such as Tsugaruishi, Kuwagasaki and Ōtsuchi. The most important clue linking the tsunami in Japan and the earthquake in the Pacific Northwest comes from studies of tree rings (dendrochronology), which show that several "ghost forests" of red cedar trees in Oregon and Washington, killed by lowering of coastal forests into the tidal zone by the earthquake, have outermost growth rings that formed in 1699, the last growing season before the tsunami. This includes both inland stands of trees, such as one on the Copalis River in Washington, and pockets of tree stumps that are now under the ocean surface and become exposed only at low tide. Sediment layers in these locations demonstrate a pattern consistent with seismic and tsunami events around this time. Core samples from the ocean floor, as well as debris samples from some earthquake-induced landslides in the Pacific Northwest, also support this timing of the event. Archaeological research in the region has uncovered evidence of several coastal villages having been flooded and abandoned around 1700. Local Native American and First Nations groups residing in Cascadia used oral tradition to transmit knowledge from one generation to the next, so there is no written documentation like with Japanese tsunami. However, numerous oral traditions describing a great earthquake and tsunami-like flooding exist among indigenous coastal peoples from British Columbia to Northern California. These do not specify an exact date, and not all earthquake stories in the region can be definitively isolated as referring to the 1700 quake in particular; however, virtually all of the native peoples in the region have at least one traditional story of an event much stronger and more destructive than any other that their community had ever experienced. Some of the stories contain temporal clues — such as an estimate of how many generations had passed since the event — which can be traced back to a date range in the late 1600s or early 1700s, or which concur with the event's timing in other ways. The Huu-ay-aht legend of a large earthquake and ocean wave devastating their settlements at Pachina Bay, for instance, speaks of the event taking place on a winter evening shortly after the village's residents had gone to sleep. Masit was the only community on Pachina Bay not to have been wiped out, as it sat on a mountainside approximately 75 feet above sea level. Nobody else from Pachina Bay survived the event — Anacla aq sop, a young woman who happened to be staying at Kiix?in on the more tsunami-sheltered Barkley Sound at the time of the event, came to be known as the last living member of her community. Kwakwaka'wakw (Kwakiutl) stories from the north end of Vancouver Island report a night-time earthquake that caused virtually all houses in their community to collapse; Cowichan stories from Vancouver Island's inner coast speak of a nighttime earthquake, causing a landslide that buried an entire village. Makah stories from Washington speak of a great night-time earthquake, of which the only survivors were those who fled inland before the tsunami hit. The Quileute people in Washington have a story about a flood so powerful that villagers in their canoes were swept inland all the way to Hood Canal. Ethnographic research has focused on a common regional pattern of art and mythology depicting a great battle between a thunderbird and a whale, as well as cultural signifiers such as earthquake-inspired ritual masks and dances. The geological record reveals that "great earthquakes" (those with moment magnitude 8 or higher) occur in the Cascadia subduction zone about every 500 years on average, often accompanied by tsunamis. There is evidence of at least 13 events at intervals from about 300 to 900 years with an average of 570–590 years. Previous earthquakes are estimated to have been in 1310 AD, 810 AD, 400 AD, 170 BC and 600 BC. As seen in the 1700 quake, the 2004 Indian Ocean earthquake, and the 2011 Tōhoku earthquake and tsunami, subduction zone earthquakes can cause large tsunamis, and many coastal areas in the region have prepared tsunami evacuation plans in anticipation of a possible future Cascadia earthquake. However, the major nearby cities, notably Seattle, Portland, Vancouver, Victoria, and Tacoma, which are located on inland waterways rather than on the coast, would be sheltered from the full brunt of a tsunami. These cities do have many vulnerable structures, especially bridges and unreinforced brick buildings; consequently, most of the damage to the cities would probably be from the earthquake itself. One expert asserts that buildings in Seattle are vastly inadequate even to withstand an event of the size of the 1906 San Francisco earthquake, let alone any more powerful one. Kenneth Murphy, who directs FEMA's Region X, the division responsible for Oregon, Washington, Idaho, and Alaska, put it quite dramatically: "Our operating assumption is that everything west of Interstate 5 will be toast." 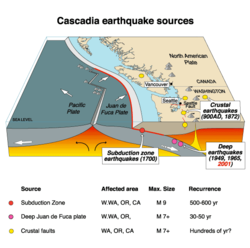 Recent findings conclude that the Cascadia subduction zone is more complex and volatile than previously believed. In 2010, geologists predicted a 37 percent chance of an M8.2+ event within 50 years, and a 10 to 15 percent chance that the entire Cascadia subduction zone will rupture with an M9+ event within the same time frame. Geologists have also determined the Pacific Northwest is not prepared for such a colossal quake. The tsunami produced could reach heights of 80 to 100 feet (24 to 30 m). A 2004 study revealed the potential for relative mean sea level rise (cause by subsidence) along the Cascadia subduction zone. It postulated that cities on the west coast of Vancouver Island, such as Tofino and Ucluelet, are at risk for a 1–2 m subsidence, relative to mean sea level. The confirmation of their oral traditions about a great earthquake has led many aboriginal groups in the area to initiate projects to relocate their coastal communities to higher and safer ground in preparation for the predicted next earthquake. The Huu-ay-aht people have rebuilt their administration building on a high point of land in their territory; coastal residents are immediately evacuated to this building whenever a tsunami warning is issued, as an interim measure toward eventually relocating all residents to higher ground. The Quileute people secured a land grant from the federal government of the United States in 2012 to move their settlement inland, both as protection from a future tsunami threat and because of more frequent flooding on the Quillayute River. The Shoalwater Bay Indian Tribe has also set a goal of moving their community uphill and has received a FEMA PDM grant to build the first vertical evacuation tower on their coast, scheduled to be completed near the Tokeland Marina by 2022. Some other subduction zones have such earthquakes every 100 to 200 years; the longer interval results from slower plate motions. 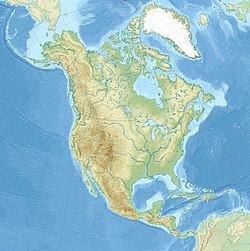 The rate of convergence between the Juan de Fuca Plate and the North American Plate is 60 millimetres (2.4 in) per year. ^ Atwater, B. F.; Musumi-Rokkaku, S.; Satake, K.; Yoshinobu, T.; Kazue, U.; Yamaguchi, D. K. (2005). The Orphan Tsunami of 1700—Japanese Clues to a Parent Earthquake in North America. U.S. Geological Survey Professional Paper 1707. United States Geological Survey–University of Washington Press. ISBN 978-0-295-98535-0. ^ Hill, Richard L. (2002-05-15). "Great Cascadia Earthquake Penrose Conference". The Oregonian. Archived from the original on 2008-10-24. ^ Kenji Satake; Kunihiko Shimazaki; Yoshinobu Tsuji; Kazue Ueda (18 January 1996). "Time and size of a giant earthquake in Cascadia inferred from Japanese tsunami records of January 1700". Nature. 379 (6562): 246–249. Bibcode:1996Natur.379..246S. doi:10.1038/379246a0. ^ a b c d Kathryn Schulz (July 20, 2015). "The Really Big One". The New Yorker. ^ a b "Jan. 26, 1700: How Scientists Know When The Last Big Earthquake Happened Here". Oregon Public Broadcasting, January 26, 2015. ^ "Ghosts of Tsunamis Past". American Museum of Natural History. ^ "Tsunamis and Earthquakes - Native American Legends of Tsunamis in Pacific NW - USGS PCMSC". ^ "Prepare for next tsunami, says chief". Raven's Eye, Vol. 8, No. 9, 2009. ^ "Cascadia’s Locked Fault Means Massive Earthquake Is Due in Pacific Northwest: Seismologists". Indian Country Today Media Network, December 16, 2014. ^ a b "Haida Gwaii Quake Brings Home the Importance of Quileute Relocation Legislation" Archived 2016-08-23 at the Wayback Machine. Indian Country Today Media Network, November 6, 2012. ^ "Get ready for the Big One". The Globe and Mail, April 22, 2011. ^ Witter, Robert C.; Kelsey, Harvey M.; Hemphill-Haley, Eileen (October 2003). "Great Cascadia earthquakes and tsunamis of the past 6700 years, Coquille River estuary, southern coastal Oregon". Geological Society of America Bulletin. 115 (10): 1289–1306. Bibcode:2003GSAB..115.1289W. doi:10.1130/b25189.1. ^ Yanev, Peter (27 March 2010). "Shake, Rattle, Seattle". The New York Times. p. WK11. ^ Schulz, Kathryn (20 July 2015). "The Really Big One". The New Yorker. ^ "Odds Are 1-In-3 That A Huge Quake Will Hit Northwest In Next 50 Years". Oregon State University. 24 May 2010. Archived from the original on 27 May 2010. Retrieved 2010-05-24. ^ "Odds are about 1-in-3 that mega-earthquake will hit Pacific Northwest in next 50 years, scientists say" (Press release). Oregon State University. May 25, 2010 – via Science Daily. ^ "Perilous Situation". The Oregonian. 2009-04-19. Archived from the original on 23 April 2009. Retrieved 2009-05-12. ^ Leonard, Lucinda J.; Hyndman, Roy D.; Mazzotti, Stéphane (2004). "Coseismic subsidence in the 1700 great Cascadia earthquake: Coastal estimates versus elastic dislocation models". GSA Bulletin. 116 (5–6): 655–670. Bibcode:2004GSAB..116..655L. doi:10.1130/B25369.1. ^ Munro, Margaret (March 8, 2012). "Monster earthquake threat looms over B.C. coastal communities". Vancouver Sun. ^ Kate Potter (September 2007). "The Big One: Understanding Why The Big Earthquake Is Predicted For Vancouver". The Science Creative Quarterly. Archived from the original on 27 May 2009. Retrieved 2009-05-18.